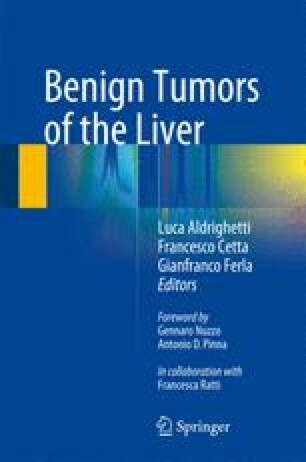 Hepatocellular benign tumors are characterized by benign proliferation of hepatocytes with a mass-forming presentation and mainly consist of hepatocellular adenoma (HA) and focal nodular hyperplasia (FNH) [1, 2]. HA and FNH share common features. First, a large female preponderance has been found in both diseases, with a female/male ratio = 8:1 for FNH and 9:1 for HA. In addition, FNH and HA derive from the proliferation of mature hepatocytes and arise on an otherwise normal liver. Therefore, they represent a model to study liver tumorigenesis outside the classic background of cirrhosis .